The “new face of Chicago soul” has a brand new single out now on Rabbit Factory Records. This Wilco cover is the b-side. The a-side, “Get It Together,” is a funky original that sounds like it could be a James Brown outtake. Great stuff. 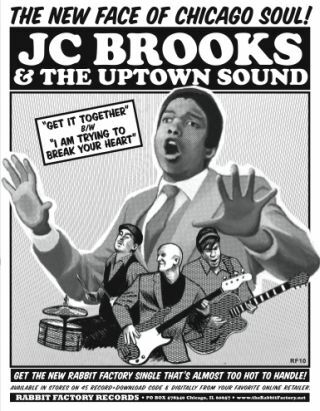 JC Brooks & the Uptown Sound: iTunes, Amazon, MySpace. I think one sign of a great song, is when it can be covered in a completely different way and still be great. God Bless Jeff Tweedy. This is a brilliant cover.